Depending on conditions, the type of presentation may vary. 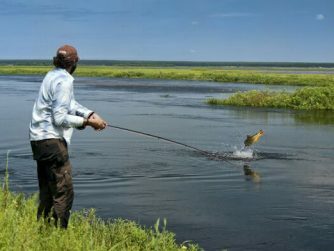 sometimes a splashy landing of the fly in the water is actually effective as a trigger for a strike. In other cases, the opposite, a very sutil and noisless presentation is the way to go. If you are torn about this at any point, your guide will surely give you good advise about this. During the retrieve, in many cases, is convenient that the rod tip is positioned slightly under the water surface. This will allow the fly to be stripped without the line creating heavy disturbance on the water. During times with high winds the presentation is not as important. This is due to water already having a lot of turbulence on the surface because of the wind. This therefore masks the disturbance made when the fly and line is presented on the water. 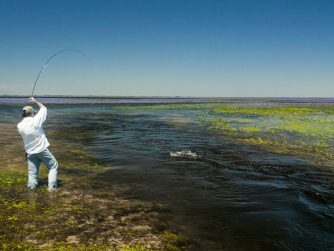 Casting in the Iberá marshlands requires different approaches. 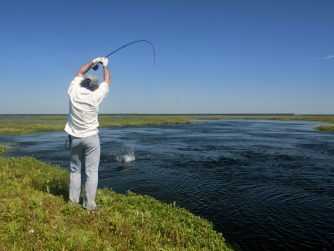 In general, when casting in a channel at the marsh, it is important to cast as close to the weed/bank as possible. When you are prospecting the waters instead of sight casting, casts should be placed in to every fishy looking piece of water This are usually, confluences, corners, bays, points and othe forms of structure. 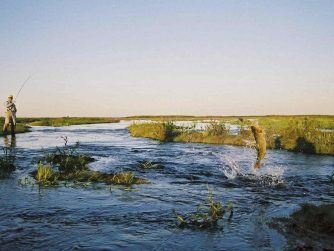 Many of this streams at the Marsh have quiet tall ride over in the back, therefore high backcast are ofen usefull. 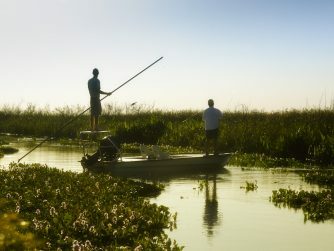 When fishing the Corriente river, we use both floating and sinking lines. Normally when fishing floating lines we cast to the edges of the river where Dorado hang out to feed. When casting sinking lines in most cases we do it across; we work swinging and stripping the fly. Stripping speed can vary depending on the speed of the current, fish moods, etc. In most cases, an erratic fast stripping is the all round tecnic but again this might vary according to the fish behaivor. A fishing glove or a finger cloth might be usefull for intense stripping. 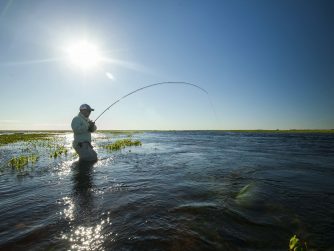 To avoid the midday heat, anglers generally leave the lodge early in the morning around 8 am or earlier. Guests return to the lodge for a swim, lunch and drinks at around 12.30 pm. After Lunch and a siesta boats will typically leave the dock around 4:30, returning at dusk. Fishing hours will change slightly depending on the time of year. Non-fishing activities such as horseback riding, or bird watching are available to allow our guests to enjoy the amazing wildlife in the area, and should be organized with the head guide. The swimming pool is the perfect place for relaxing and sunbathing. Snorkeling and Night expeditions into the Marsh are also exciting options. Rods: We recommend 9-foot 7 or 8-weight rods. Sage makes some of the best dorado rods available. In addition to a lifetime warranty, the company engineers several highperformance options perfectly suited for fishing at Pira. Reels: A quality fly reel is important. A strong, smooth drag is a must, as larger dorado are both strong and fast. Reels should have capacity for the fly line and 100 yards of 20-pound backing. 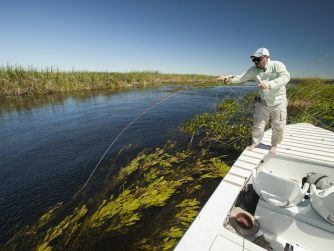 Lines: Pack weight-forward tropical floating fly-lines (redfish, tarpon, and bonefish lines works well). Also consider “over-lining” your rods. 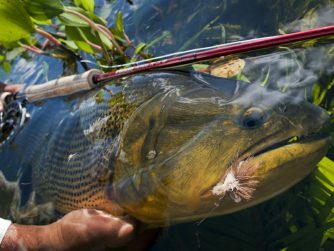 For example, we often use a 8-weight floating line on an 7-weight rod, which has dual benefits: 1) It makes it easier to load the rod with less line and 2) the heavier line makes casting larger flies easier. Additionally, we recommend bringing a fast-sinking line such as Rio’s Leviathan (or similar), which has a 26-foot, 300- to 350-grain sinking tip. Intermediate tip lines are good options, too, including RIO’s General Purpose Tropical F/I. Note: DO NOT bring conventional cold-water floating lines. Our tropical weather makes them soft and gummy and therefore difficult to cast. Leaders: the leaders should be heavy enough to turn over big flies. Spools of mono should include 15, 20, 30, 40, 50 lbs, test weights. For floating lines you should have 9 foot long tapered leaders (Knotted or Knotless, depending on your personal preference). For sinking lines 4-6 feet of 30 lb. mono should work well in most conditions. Maxima Ultragreen Mono is a good option for leader material. 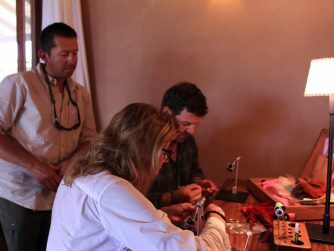 An important thing to consider in a Dorado leader is the shock, or bite tippet. These fish have very sharp teeth that will cut even the strongest mono. Bring plenty of 20 to 40 lb test steel leader for your stay. AFW (American Fishing wire) in mate camo colour is a favorite among our guides. 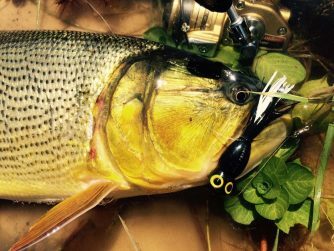 In most cases, golden dorado prefer dark streamers that produce visible silhouettes. Nervertheless, there are situations when carrying a mixture of brighter colors can be effective. So don’t be afraid to experiment across the color spectrum. All flies should be tied on stout 1/0 to 3/0 hooks. Streamers can be tied from 4 to 6 inches long, or longer. However, it’s important that they’re light enough to cast. For the real big stuff, we recommend hydrophobic materials that shed water and therefore cast farther than a water-soaked materials. In order to make your flies more durable, add glue or epoxy throughout the tying process if necesary. 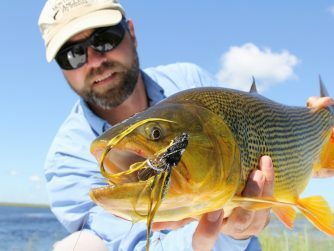 For more details on a few of our favorite, dorado flies—including how to properly tie and fish them—follow the link. Rods: In both cases, spinning and bait-casting, fix to 8 ft rods for ligth to middium action are recomended. 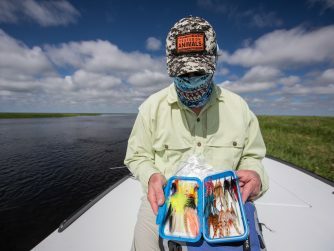 Reels: Open-face spinning reels are the easiest to use but, in experienced hands, bait-casters are the easiest to use accurately and they give you the best chance to place your lure where you want it. Bait-casters should feature a high-speed retrieval ratio, as lures are normally worked very rapidly. Whichever style is your favorite, it will need to be loaded with 25-30 lb line. Leaders: Steel leaders are a must. Dorado have sharp teeth and a 5 to 10 inch, 20-30 lb test steel leader is needed. Lures: The list is never-ending. Don’t be afraid to take your own and experiment. 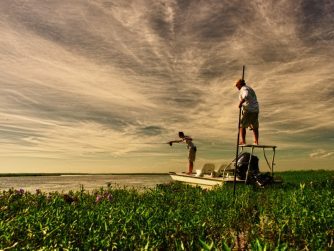 There’s always a chance that the lure you bring will change our way of fishing forever. Note: for those how enjoy the pleasure of ultra ligth fishing the area has very good possibilities not only for dorado and tararira but for a number of interesting native species.